CUISINE: Macrobiotic re-interpreted by the owner Daniela with both Mediterranean and international influences. SERVICE: Buffet, Cafeteria, Counter and Take-out. SPECIALTIES: Too many to list, the menu changes every day; however, we can say that Daniela is very well known in town and by tourists/foreign workers passing by for her personal and tasty interpretation of macrobiotics. Suggested also to non-vegetarians. 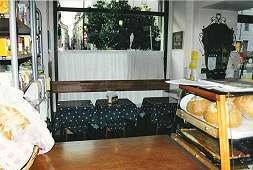 FEATURES: The restaurant is in a 19th century building and in the middle of the most lively area of the city. The restaurant (actually more like a cafeteria) closes early and is therefore suggested for lunch rather than dinner. It is also an organic food store, and only organic food is used in the kitchen. It was established in 1994. DIRECTIONS: The restaurant is right in the historic centre, there is no shortage of paying parking lots in the surroundings, it is also 10 minutes' walk from any place of interest in the city, as the the centre is not too large.